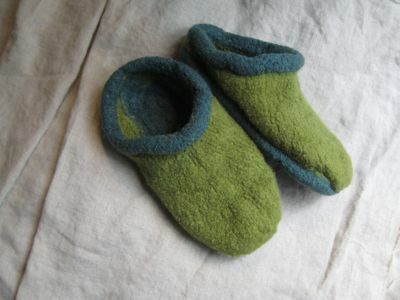 Two years ago for my birthday, Anne gave me a pair of felted slippers that she asked Val to make just for me. A wonderful gift! On a list of favorite items of clothing, they are very close to the top. Actually, right at the top. In the number 1 spot. Since the big slipper love started over here, I have knitted and felted seven pairs of these for gifts. And now one more for me. Mine don't fit and feel quite like Val's, but I'm learning to love them. Kind of a snarling toe on one. Felting is an inexact process and you never quite know how they will finish up. I'm going to mend the soles of Val's with a stitched-on-felted-sweater sole. That way I'll have back-up. Top two spots on the list. 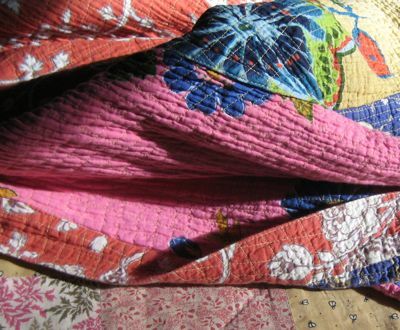 Anthro bathrobe falls to spot #3.